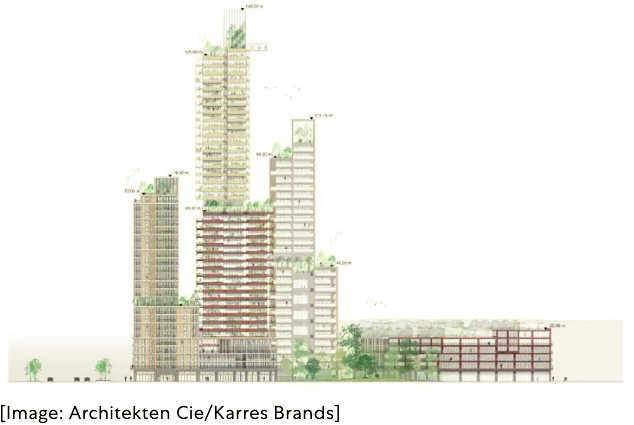 The 1,000-unit Mark, in the Dutch city of Utrecht, will be complete by 2023. The majority of its units will be low- and medium-income housing, or “care homes” for the elderly. 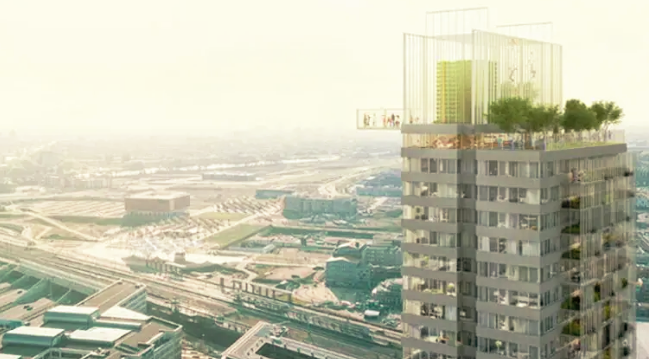 In a new apartment complex that will soon rise in the Dutch city of Utrecht, instead of deliveries from an online grocer, you can get boxes of vegetables grown in an intensive greenhouse on the roof or from a smaller unit built into the facade on your own floor. In a courtyard downstairs, you can forage for raspberries in an urban forest. In the parking garage–which is designed to house many more bikes than cars–there’s space for aquaculture. The new development, called the Mark, with more than 1,000 units in three towers, rethinks the sustainability of typical high-rise buildings. One part of that is the food that residents eat. “We put a lot of energy into diminishing the carbon footprint due to food production for the inhabitants there,” says Darius Reznek, a partner at the design firm Karres Brands, which worked on the project along with the firms Architekten Cie, Geurst & Schulze, and a group of developers. A team of urban farmers will manage the on-site greenhouses, which will also supply produce to a rooftop restaurant. At the ground level, by rethinking mobility options, the designers had more space for plants. “A lot of times, when you develop high-rises, you’re stuck with a lot of parking,” says Reznek. The new apartments are next to a train station, and the city is one of the best places to bike in the world, so residents don’t really need cars most of the time, but the developer will offer an electric car-sharing service to make it even less likely to that someone feels the need to own a car. “Instead of everyone having their own car, we will have 200 car-sharing vehicles, and we provide a lot of bikes, electric bikes, and space for things like that to kind of stimulate a different kind of mobility so that not everybody is stuck to their car,” he says. The garage can fit 3,500 bicycles; the extra space will become an edible forest. Food is also a way to bring residents together–the apartments have their own balconies, but it’s possible to visit the greenhouses or manage a plot of your own in a community garden. The buildings also nudge people to interact in other ways. “The high-rises are separated in sort of smaller neighborhoods that revolve around collective floors,” says Reznek. Along with green spaces, the buildings have shared spaces with larger kitchens, collective “living rooms” if someone needs more space for a party, shared workspaces, and other community gathering places. To make the buildings carbon neutral, the developers partnered with nearby parking garages to use their rooftop space to produce enough solar power for all of the apartments. The buildings also use a modular design that can be adapted over time, so future construction also uses less energy. The apartments, which will be completed in 2023, are meant for everyone: While some will be sold or rented at market rate, the majority will be low-income social housing, medium-rent housing, or “care homes” for the elderly. Older residents will live near a shared courtyard and near services like a physiotherapist’s office and a doctor, and can transition to assisted living while staying in their own apartments.